This weekend the Pārāwai School celebrates their 50th Jubilee. The weekend starts with an open afternoon at the school, followed by a 'mix and mingle' in the evening. Tomorrow, Saturday 28th October is the official ceremony, morning tea, decade photos and a buffet lunch. Check out the facebook page for updates. A limited edition booklet is available at the school/reunion for $15. There are 48 pages, which include a selection of memories, photographs and past details on the school. A great read for anyone interested in Thames history. 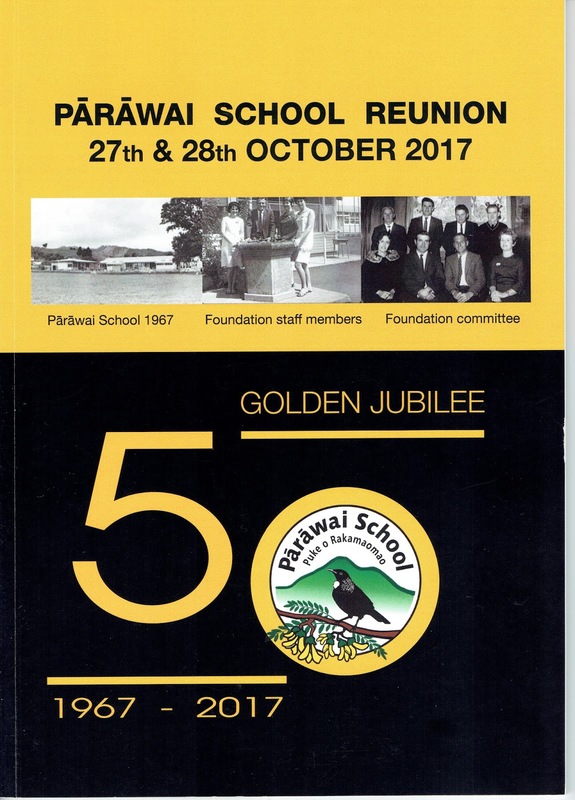 The Pārāwai School is located in Lowe Avenue, an area that was home to market gardens and sports fields following the opening of the goldfield in August 1867. The school was built to meet the needs of families in the southern end of town in the late 1960s, as the land was subdivided and houses built all along the hills leading to the Kauaeranga Valley. Photographs of Thames streets in the 1900s-1940s are fascinating for the images contained within the image. Of particular interest are the modes of transport that are glimpsed. Whether it be a horse and cab, an early bicycle, the first cars or buses that travelled the streets of Thames. 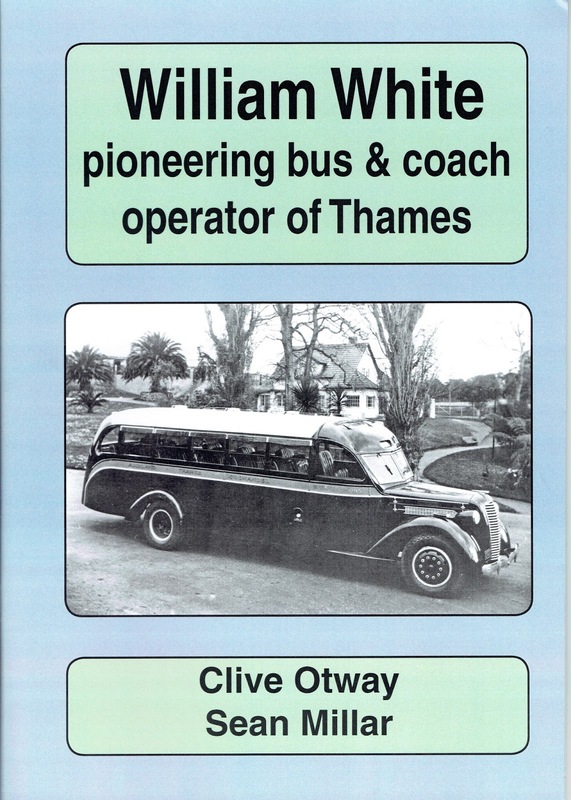 There is a 22 page booklet written by Clive Otway and Sean Millar in 2014 that covers the history of the buses that were operated by William White of Thames. A name that will be familiar to many old Thames families who will no doubt have had relatives who travelled on one of William White's fleet of vehicles. BACKGROUND: Mr White was educated at Waiokaraka School in Thames and in the early days set up a cab service around 1902. (Notice below) In 1907 White sold the cab business to Mr Meehan. Mr William White started back in business at Thames around 1910, after a stint in Coromandel as the proprietor of the 'Star and Garter Hotel'. In 1913 Mr White advertised he had purchased a beautiful Cadillac and that his garage was by the Karaka Creek, telephone number 40. Then in 1914, the business was purchased by Mr Bowles, but soon after Mr White again has the business as Mr Bowles was leaving to go to the war. The business grew until 1920 when a large concrete building was erected at the north end of Pollen Street, which would in 1947 be purchased by New Zealand Railways. 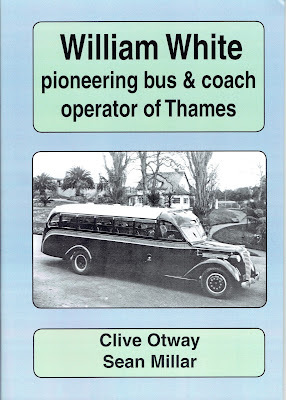 A full history of the bus services are contained within the book by Otway & Millar. 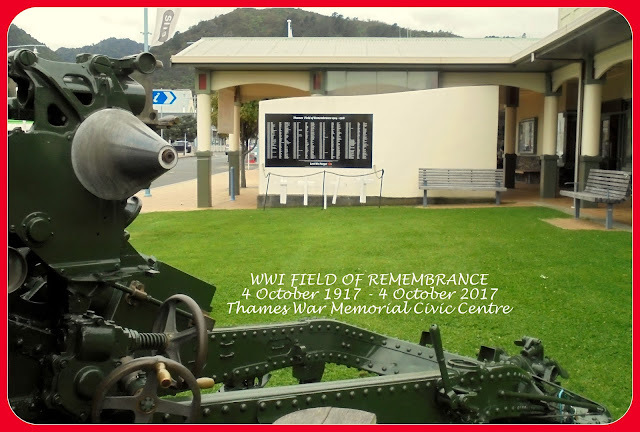 Mr William White died 9 March 1947 at Remuera. The Obituary in the Thames Star 10 March 1947 heralded the amazing service given by Mr White to the town. 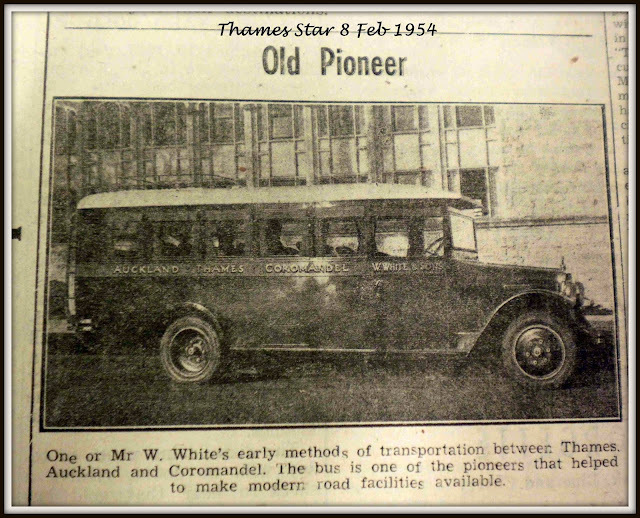 Once the road was established to Auckland in 1924, White's provided an invaluable transport link to the city. Mr White was also a chief supporter of sport in the town, and had presented several rugby championship cups (Centennial and White cups). Mr White's funeral took place at the St Paul's Church, and the burial at the Hillsboro Cemetery, Auckland. Mr White's obituary notice stated he was survived by three daughters (Mrs A Dovell, Mrs S Steele, and Mrs A R Johnston), and three sons (Messrs Roy and Ralph White of Auckland and Mr Leo White of Thames). William's wife Mary Ann had died 19 December 1944. The goldfield town of Thames is currently celebrating 150 years since the field was first opened. Many of us waited expectantly for one of the grand parades of old, we were disappointed as this time things had been done in a more low key format. The Thames Xmas Parade 23rd December is to have a gold or 150 theme, so this may rival the 1967 or 1973 parades we remember. As previously mentioned our old Thamesite ancestors had a parade at any excuse...the Coronation, Labour Days, Queen Carnivals, along with the jubilee are but a few of those that have been held in the town. Below is a photo just obtained from the Campbell Collection that shows Verran's display for the 1927 Diamond Jubilee. Interestingly this particular float was resurrected and used on several other occasions well into the 1930s. 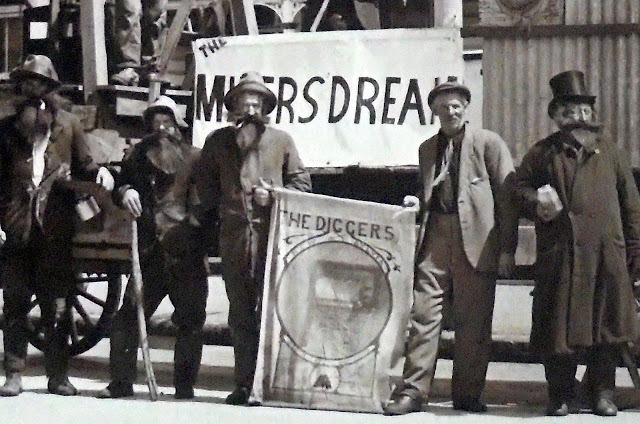 The 'Miners Dream', never had truer words been spoken - as the miners of Thames forever believed that the next great gold find was just around the corner! 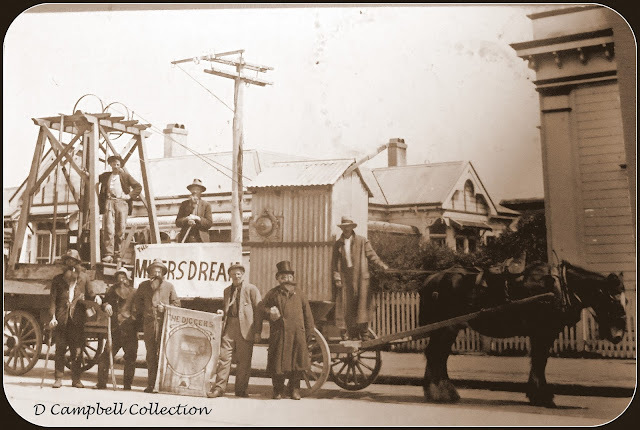 Photographs of more recent parades can be found at Kete Hauraki Coromandel. 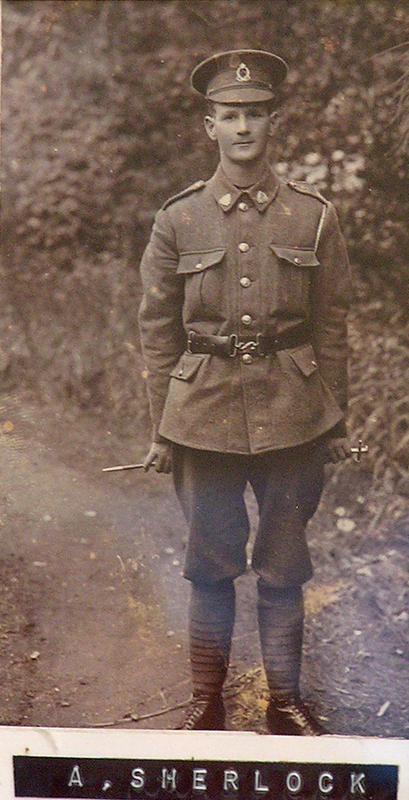 On this day (4 October 1917), one hundred years ago, nine young men lost their lives. During World War One (1914-1918), there was one month that stood out as having the darkest record for Thames, in terms of the number of Thamesites who lost their lives while fighting in the war. 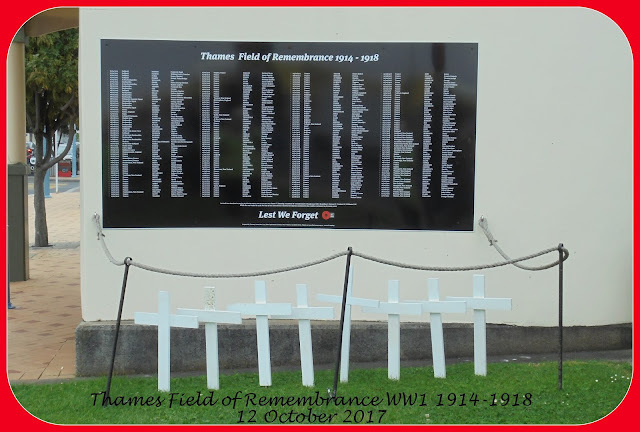 Twenty-two Thamesites died during October 1917. While acknowledging that there will be more names that we have not yet discovered as having a Thames connection. This was not just Thames' darkest month, but one day in that month was said to be New Zealand's darkest day. 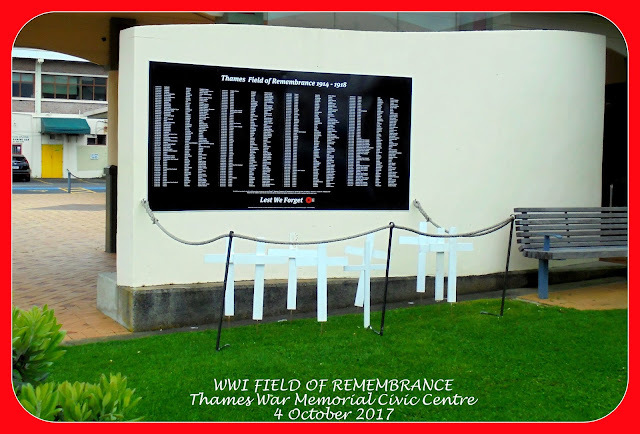 While earlier in the month 320 New Zealanders had lost their lives at Gravenstafel Spur, nothing prepared the men for what was to follow. 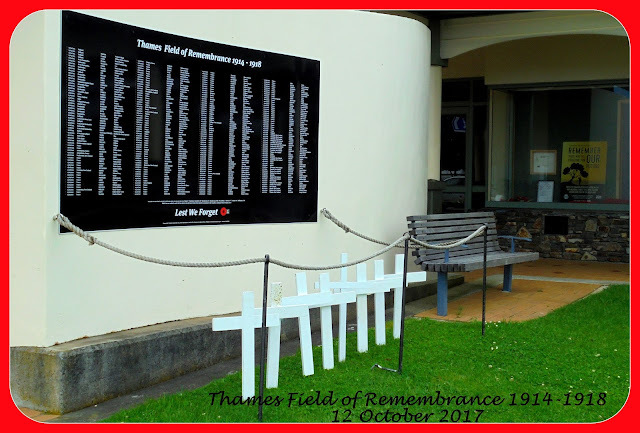 On the 12th October 1917, 843 New Zealand soldiers were Killed In Action or mortally wounded at Passchendaele in Flanders, Belgium.